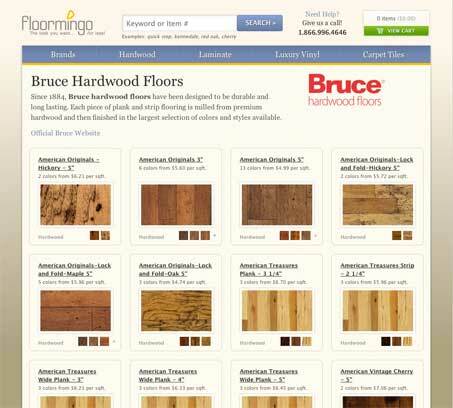 We’ve worked with the wonderful people at Floormingo since 2005 to provide a great way for do-it-yourselfers to buy hardwood flooring online at discount prices. For this year’s update we created a brand new web design and e-commerce shopping experience. Make it easier for a visitor to find the product they want and suggest related items that might meet their needs. Treat customers with respect and make them feel safe about their decision to purchase with Floormingo. Increase product awareness in the search engines. Visitors spend twice as long on the site. Unique visitors are up over 400% year over year. Sales are up over 500% from this time last year. And don’t think for one second that we’re done just yet. We have a large number of new features, minor changes and tweaks that we are testing to optimize the shopping experience even further. If you’d like to know more about the changes we’ve made and how we might help you sell on line, please give us a call at 317- 663-3296, ext 202.